Back to match reviews, here's the first big game of the season! But, first of all I would like to thank for the feedback, on my last post. My focus will remain on football analysis but, from time to time, I’ll mix in some trading topics. First Half – Chelsea’s plan goes wrong but Begovic keeps them in the game! 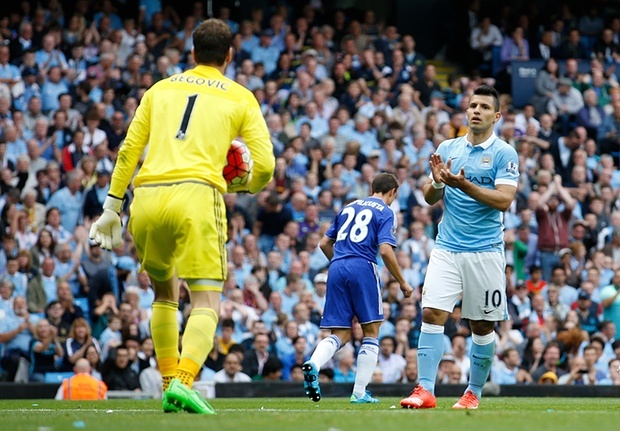 The match starts and, in a matter of seconds, Aguero is face to face with Begovic! The deadlock was not broken but it represents well Chelsea’s game plan failure. It’s usual for Chelsea to give the possession away in big matches and wait for the right moments to launch deadly fast transitions. What is not usual for them, and never happened last season, is the opposition being able to create five or six clear cut chances in 45 minutes. If you give Aguero five of these, you can consider yourself lucky if you only concede one goal, although truth be told: Begovic was amazing! Back to the game, Manchester City was incredibly dominant in the first half, especially in the first 20 minutes, where they could’ve finished it. When Chelsea was improving a little bit, Aguero proved with an amazing goal why he's the best striker in the Premier League. 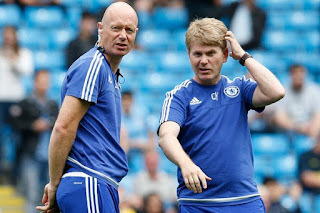 Chelsea didn’t look good at all in this half and even their medical staff looked worse than usual! Second Half – Two Belgians with a different fate: Hazard forgives while Kompany kills! Chelsea could only improve in the second half and indeed they did, controlling possession a bit more although City always looked the better team. Perhaps, the key moment was Hazard’s missed chance on minute 70 which, by the way, was their best moment in the whole match. When Mourinho decided to risk everything, Kompany sealed the game with another goal from a corner kick, beating Ivanovic in the air, who is also to blame for City’s third goal. I wrote earlier about Chelsea and Man City in my PL review, and the beginning of the season is highlighting Chelsea’s fragilities and Man City’s qualities. For the lazy ones like me, I’ll repeat it briefly: Eden Hazard is receiving the ball too early in regions where he can’t be decisive while Azpilicueta and Ivanovic don’t pose an offensive threat, leaving Chelsea with limp wings. Furthermore, and this is a new problem, Ivanovic is being exposed defensively which was pretty rare last season and throughout his Chelsea career. On the other hand, Man City is looking very good, with their possession game at its best and although it’s too early to have a final opinion, Mangala’s inclusion is helping City’s defensive problems. Today, he was really great, very composed and concentrated, and a monster in the air! First of all, this topic deserves an entire post, but as a short preview let me tell you that although it is useful to anticipate scenarios before the game, you should not be a hostage of your pre-game opinions. Practical example: I thought 2.00 was a low price for Man City pre-game. The match showed I was wrong, so does it mean that I would lose money if I was trading? Not at all, I could win or lose irrespective of my pre-game opinion as in-play trading starts when the match starts. One of the most common trading mistakes is what I like to call “to fall in love with your opinion”, where one takes positions based on its pre-game opinion, ignoring what is happening on the pitch. Bottom-line being: you don’t have to guess the match outcome to be successful as a trader, it’s all about using the markets to make a profit. The need to be right is an ego issue which doesn’t help at all when it comes to trading.